Water: Prefers wet or moist, well-drained soils. Tolerates deer, some drought, pollution, wind. Sun: Prefers sun, but is shade tolerant. Comments: Although sold as A. rubrum, are actually A. x freemanii, hybrid between it and A. saccharinum. Orange to red fall color. Wonderful fall color in moist conditions. Doesn't grow as fast as the silver maple. 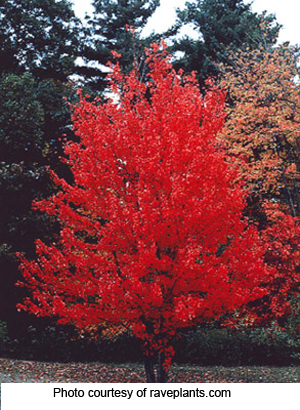 Often preferred over columnar Sugar Maple or columnar Norway Maple because it is more vigorous and tolerates heat better. Warnings: Can develop surface roots. Street Tree? yes Street Tree Conditions: Good if well watered. Narrow crown width makes it suitable for areas with limited horizontal space.